— We wish you and your family welcome to Bolmen and our small campingsite for families and anglers. We and our skilled staff will give you the best available service. We started 1979 by renting out canoes. At our camping we have 5 well equipped cottages for renting, 40 camping places and 30 electric places. In other words – a small and friendly camping. Our business goal is to supply quality not quantity and we aim to create the neccessary conditions in order for our guest to get a pleasant stay with us. The charming village of Bolmen is located in the southern part of Småland and Lake Bolmen is Sweden’s 10th biggest lake. The distance from Helsingborg is about 130 km and it’s 60 km from Halmstad. 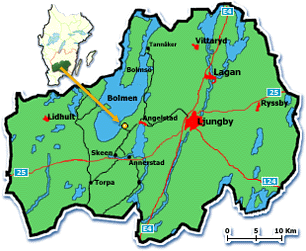 To E4 in Ljungby it’s about 20 km and about 60 km to the closest railway station in Alvesta. From Helsingborg it’s about 1,5 hours and from Halmstad less than an hour by car. If you come by bus, there are several connections each day from Helsingborg. From Ljungby there is bus No. 146, several times a day Monday through Friday. We can also be of assistance for group transports to and from Bolmen.